My 3-1/2 year old daughter went from being a wonderful eater as an early toddler to being very picky and finicky. She never eats the food we eat and I am constantly making her any food I know she will eat and this list is becoming smaller and smaller. Any tips on getting her to be less picky would be greatly appreciated! I know the frustration you are speaking about and have heard so many similar situations over the years. I have experienced it in my own house and have had workshops with parents of preschoolers on this very topic. Think about your preschooler for a minute. How many choices does she have each day? Probably not too many. This is the time preschoolers gain independence and they test it – they are becoming their own little people and are trying to navigate their world. They quickly learn that they have control over food. Nobody can make them eat … and they will test you at this. But the great thing going for you is that preschoolers also like to please. Keep in mind that children learn new food preferences through repeat exposure, and it could take 8 to 10 tries of one food alone before they might accept it. If your child doesn’t like a food when he or she tries it for the first time, don’t give up. Try to introduce only 1 new food at a time and present them at the start of the meal when children are hungrier. Small portions can also yield big results. Let them have a taste of new foods you like. Try foods that appeal to senses like finger foods; foods that crunch or crackle; food with different flavors. 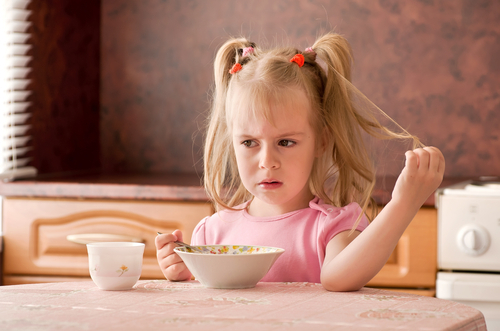 Some preschoolers go through “food jags” where they will only want a few limited foods. I know this is concerning but know that the likelihood of them being nutritionally deprived is most often slim. In studies looking at toddler food consumption – when you average out the intake over 7 days – they were getting all the nutrition they needed despite very limited intake on certain days. Finicky habits are almost always temporary. There is a fine balance to deal with food jags – too much talk about it might make them worse (reminding them of their control over the situation), not enough might make them stay. Gentle discussion about being healthy is a good idea. At our house we use the car example quite a bit. Just as a car needs special gas inside of it to give it energy and power, we need fuel from our food to give us power and energy. When we put too many unhealthy foods in our bodies, our bodies become sluggish just like putting the wrong things inside a car’s gas tank would make it not run near as smooth. Set a good example. Eat together and let your child see you enjoying a variety of foods such as fruits and vegetables at every meal. Set Limits. In working with families this was astonishing to me. I think in general, parenting styles have become more hands off in that we are setting less and less limits on our children. In a class I taught with elementary school kids and their parents we touched on this topic in one of our sessions. I had three parents come to me after the class to tell me they did not like the limit setting chapter and discussion. That was very telling to me! Even if kids want the full size snickers bar – it is OKAY to say no. Choosing Fruity Pebbles for breakfast everyday is not okay. We are the parents and we need to be the ones to help steer our children into the right decisions. Talk, talk, talk. Let your children hear you describing foods or hunger cues or planning. “This apple tastes so crunchy!”, “I am feeling hungry but I have not had many fruits and vegetables today – I should grab a fruit.” It sounds different but it really helps to role model healthy eating behaviors. This is so critical and very much a lost art in our busy and hectic lives where we are always eating on the fly. Actually, this is where I believe we can impact preschoolers the most. I personally feel that nutrition today and the issues we have with obesity and subsequent health problems is in a large part due to not just what we put in our body or don’t put in our body but about how we think about the food we put in our body. Offer choices. Which one would you like, the broccoli or cauliflower? Make food fun. Use cookie cutters. Call foods by fun names. Name a dish after your child, “Sarah’s Sweet Potatoes”. Use sauces, dips, cheese bowl – any way the children can be involved in the meal, the better. They will feel ownership and pride. Eating the alphabet … the hungry caterpillar. Keep things positive. Discourage older children (and even adults!) from making negative comments or making faces. For new foods, be upbeat about them. Cook together. I know this is not feasible every night but every now and then, involve your child in some meal prep even if it is a simple task. Sometimes there may be time for them to help a lot – their involvement in food should pay off with their interest in trying their creations! Fieldtrip to try new foods. At the grocery store, have them pick out their fruit or vegetable choice of the week to try new foods. Cookbook. Look through a cookbook together and have them choose a few recipes they want to try. Have some back up catch-all foods. Smoothies are a great idea as you can sneak a lot of nutrition into a smoothie. Above all, be patient and hang in there. Most children go through some type of food challenge and as frustrating as it can be, it really does provide a great opportunity to teach them about nutrition and the importance of healthy eating.